In 1998 the Municipality of Reggio Emilia purchased the ‘Locatelli’ cheese warehouses so they could become both home to the Loris Malaguzzi International Centre and at the same time a symbol of urban renewal in this northern area of the city where the first industrial area was located. The Loris Malaguzzi International Centre was opened in February 2006. It was created to give greater value to a strong and distinctive characteristic of Reggio Emilia; the ability to lend listening, visibility and support to the rights and requests of children, young people, families and teachers. 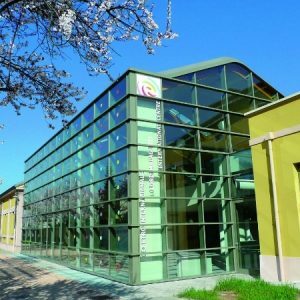 The Centre is a dedicated meeting place where professional development and research intersect for people in Reggio Emilia, Italy and the world who wish to innovate education and culture. The Loris Malaguzzi International Centre it is an open place so that its potential can be appreciated; open to all ages, to ideas, different cultures, to hope and imagination. A place of the possible, both necessary and useful for the concept of a city ascribing value to change. The second phase of renovation work began in 2007, and now completed, includes a preschool, the first two years of elementary school, a bookshop and a reception area with restaurant and hospitality facilities. A place of places taking inspiration from the Reggio educational experience but looking to the future and giving definition to the international and multicultural dimensions existing since its inception. Centre – as Loris Malaguzzi defined it in his talk at the Kohl Foundation – port, place for exchange, for ships to anchor in the evening and take provisions. But above all a place where they come to tell stories and listen, for through narrating and listening we change and we grow. The Centre therefore is a place of listening just as our schools are first and foremost places of listening. That is why the Centre takes the relativity of points of view, of dialogue and therefore of research as its primary value.